A cross-party group of politicians are pushing ahead with a bid to review whether the UK can unilaterally withdraw its Article 50 notification. Prime Minister Theresa May triggered Article 50 last year, committing the UK to leaving the EU in March 2019. Last week, the politicians went to court to seek permission to go to the European Court of Justice for a ruling on whether Brexit could be called off. A judge at the Court of Session refused to allow their action to proceed. Labour MEPs David Martin and Catherine Stihler, SNP MEP Alyn Smith and Scottish Green MSPs Andy Wightman and Ross Greer are now appealing against Lord Doherty's decision. 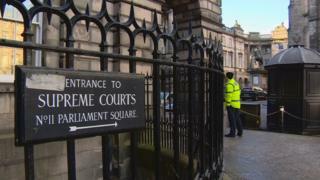 The judge had rejected their initial application for a judicial review, saying that the group's "prospect of success falls very far short". The judge said that "given that neither parliament nor the government has any wish to withdraw the notification", the question whether or not it could be done unilaterally "is hypothetical and academic". Lord Doherty said the UK parliament had not proposed withdrawing the UK's Article 50 notification and government policy was not in conflict with the legislative will of parliament. He added: "In those circumstances it is not a matter which this court, or the Court of Justice of the European Union, require to adjudicate upon". During a brief hearing at the Court of Session on Thursday, a new hearing was fixed for Wednesday 21 February when three judges will hear the challenge to Lord Doherty's ruling. Lord Drummond Young said: "It is important to bear in mind what we are concerned with is not the substance of the application but with permission to proceed."